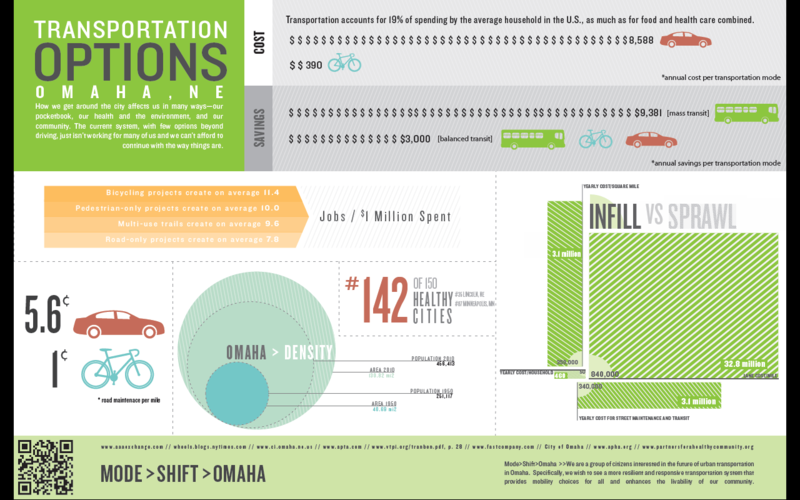 Tonight at 6:30 we learn what Omaha has in store for our transportation future. Tonight, in the cozy comfort of the Scott Conference Center on the south campus of UNOmaha, we should get a better sense of the big picture and the changes to come. Speaking of the big picture. Mike Houston has been kind enough to combine all the infographics he’s been working on into one super-graphic. This should help put transportation issues in a visual context and allow you to not only see the benefits of expanded transportation options, but to see the costs and problems we face if we do nothing. Doing nothing is no longer an option. We can no longer afford to deny people real transportation options. The cost of continuing with car-only transportation will bankrupt our city and deny real freedom of choice to every Omahan. If you are tired of the government and developers providing only one mode of transportation, imposing the defacto tax of forced automobile ownership, then please come to the meeting tonight. There will be plenty of parking for cars and bikes and a special bus is bringing riders from Westroads and Crossroads. See: options. You get to choose how you arrive at the meeting. That’s great. See you tonight.